Over the past few years, Techtextil and Texprocess have established themselves as leading trade fairs for technical textiles, nonwovens and for processing textile materials ─ including on an international level. And the number of over 47,500 visitors from a total of 114 countries in 2017 shows that the popularity is continuing to rise. 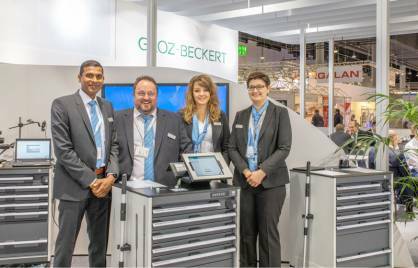 Groz-Beckert can only confirm this development – more visitors than ever where welcomed at the stand at the Frankfurt exhibition center this year from 9 - 12 May. With the presentation of the INH (Ideal Needle Handling) quality management and a live demonstration of the customer portal, Groz-Beckert focused on process optimization in the field of sewing. The patented INH process impressed in particular with its digital solution for documenting needle breakages. Via a mobile app and browser software, Smart INH enables the data sets to be saved and stored digitally as potential evidence. INH also helps with handling sewing machine needles during the entire sewing operation. Of course, trade fair visitors also had the opportunity to experience the needle output carriage and its practical accessories specially developed for INH live in both digital and analog form. Another highlight in the sewing field was the "Mobile Lab", which enabled material samples to be inspected and analyzed directly at the Groz-Beckert stand. Not just a highlight of the product range: The PosiLeno® leno system also made a name for itself at the trade fair stand. 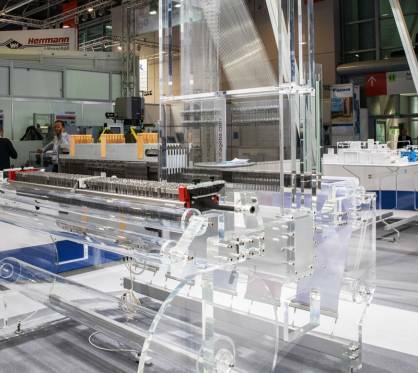 Visitors to the stand were able to observe it in operation in addition to heald frames, healds, warp stop motions and drop wires on a weaving machine model made from acrylic glass. The leno system also impressed with its potential to increase efficiency by up to 100 percent. There was a high demand for information on the worldwide service offered in the field of weaving, which sets itself apart in particular with expert knowledge and intensive application advice. 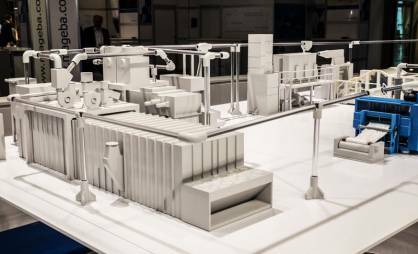 Using a detailed model, visitors to the stand experienced the staple fiber needle punch line launched in March this year in the Technology and Development Center (TEZ) at the headquarters in Albstadt. The expansion of the application advice in this field also attracted large amounts of interest at Techtextil. The felting division also presented two further innovations with Groz-Beckert® dur and the HyTec® P-jet strip. While Groz-Beckert® dur needles impress with improved resistance to corrosion and an up to 30 percent longer service life, the new jet strip impresses with improved handling and a significantly increased hardness, which has a positive effect on all mechanical properties, such as scratch resistance, bending stiffness and service life. The focus in the field of carding was on the high-performance worker and doffer wires SiroLock® and EvoStep®. While the EvoStep® card clothing aims to reduce raw material consumption, the focus of SiroLock® card clothing is on boosting performance of the roller card via high delivery rates and nonwoven weights. For knitting and warp knitting customers, the Groz-Beckert stand offered the product portfolio for circular knitting, warp knitting and flat knitting technologies. Tailored solutions provide the answer to increasing requirements with regard to wear, resilience of knitting components and ability to process a wide range of materials such as metal or glass fibers in the flat knitting sector. In the field of circular knitting too, the trend in technical textiles is moving towards customer-specific solutions, which Groz-Beckert can offer in the form of comprehensive solutions for all knitting components – needles, system parts and cylinders. For warp knitting, the production of technical textiles is still an extremely important part of the entire textile production process, which is why Techtextil has been one of the most important trade fairs in the warp knitting sector since it was founded. At the Groz-Beckert stand, this was reflected in the presentation of a warp knitting model made from acrylic glass. The presentation showed visitors the smooth interplay of the individual warp knitting modules and the benefits of system solutions from Groz-Beckert impressively. For Groz-Beckert, Techtextil 2017 was an opportunity for interesting conversations and exciting meetings. 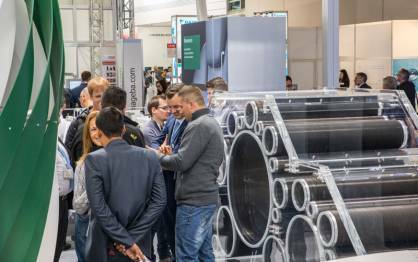 The number of visitors and the throng of people at the stand showed that technical textiles are continuing to gain in importance. Groz-Beckert is accompanying this development every day with products and services for the requirements of tomorrow.